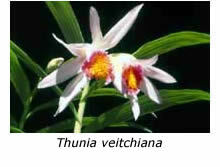 The genus Thunia comprises five or six terrestrial species that are native to the Himalayan regions and Burma. 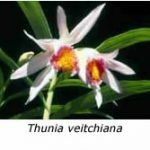 By far the most commonly grown species in Victoria is Thunia marshalliana, also known by the synonym T. alba, although some growers believe that the two are different. Other thunia species include T. bensoniae, T. pulchra and T. venosa. Thunias are biennial plants that develop in spring from the previous season’s growth, which withers and dies during the second season. The new cane develops rapidly during spring and early summer, carrying its leaves alternately along the stem in the same way as bamboo. In fact, ‘bamboo orchid’ is a common name for T. marshalliana. In nature the canes may grow as long and as thick as broom handles but fortunately they seldom reach this size when the plants are grown cold in Victoria. The terminal inflorescence, which usually begins to open around New Year’s Day, can eventually carry up to a dozen large white flowers, each with a fringed lip marked with yellow and orange. I also grow two other thunias, one a species, the other a hybrid. The species, T. venosa, was collected by a friend in Nepal many years ago before CITES regulations were introduced. It has white flowers with purplish striped lips and grows less vigorously than T. marshalliana under my cultural conditions. The hybrid, T. Veitchiana, was made almost 120 years ago by crossing T. marshalliana with T. bensoniae. The lip of its otherwise white flowers is mauve-purple with purplish veins. Thunias may be grown under a variety of conditions. Some growers insist that they will flower only if grown in full sun, while others have no difficulty in flowering them under quite shady conditions. And while some growers assert that a heated glasshouse is necessary, others grow and flower them outdoors in Melbourne. Undoubtedly the conditions where they grow in nature are warmer than Melbourne in winter but this is probably immaterial because the plants remain totally dormant during winter. When grown outdoors in Melbourne they commence growth only when the warmer days of October arrive, although they shoot several weeks earlier if the plants are housed in a heated glasshouse. The conditions under which I grow my plants of T. marshalliana are those that David Banks (a Sydney resident and editor of the Australian Orchid Review) first advised me to use over five years ago. The previous season’s leafless canes should be stored in a warm, dry spot over winter until new growth appears at their base in late September. They should then be planted in a terrestrial mix containing bark, peat moss, sand, tree fern, mountain soil and Sphagnum moss (the proportions seem to be relatively unimportant). Only the roots of the new growth should be buried in the mix (it’s necessary to stake each cane to prevent it toppling). The mix is then topped with a handful of Dynamic Lifter® or similar pelletised animal or fowl manure. At this point the pot is stood in a container, such as large plastic ice-cream bowl, to which water is added to a depth of about 50 mm. Finally another handful of Dynamic Lifter® is added to the water, and the whole assembly is placed outdoors in a sheltered, sunny position. The water in the bowl is kept at the same level throughout the growing season (a hole drilled in the bowl’s side about 50 mm from the bottom ensures that the level does not rise above the optimal level after topping up or in rainy weather). The new growth develops at a prodigious rate, reaching a height of at least 600 mm within three months. The flower buds develop during December and open sequentially, the first appearing by the end of the month and others during January (the first to open has usually fallen by the time the later buds open). Usually I place the plants under cover when in flower to prevent discoloration and damage, which may result from strong sunshine, rain or hail, all of which may occur in Melbourne during January, occasionally on the same day. The above cultural notes should not be regarded as the only way to grow and flower T. marshalliana in Melbourne. Other growers have equal or greater success without standing their plants in water and using simple bark-based potting mixes in an enclosed, shaded glasshouse.